CORE is shortlisted for the Best Business Book Awards in the Engaging Change category. At the core of the world's most admired businesses lies a powerful Single Organizing Idea. These organizations deliver sustainable economic and social benefit; they unite people, attract investment, inspire innovation, pioneer new efficiencies, and enjoy positive reputation. Such businesses are admired but they remain a rare breed. Though the tides of change are engaging the minds of business leaders, most are still trapped behind their brands and an approach to corporate social responsibility that is out of step with a connected society that increasingly questions 'who' these businesses really are and what drives their purpose. 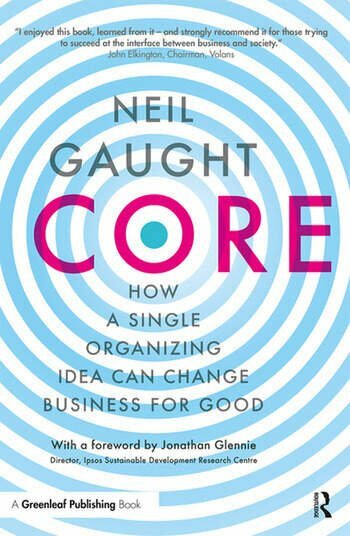 This book is about how businesses can adopt a Single Organizing Idea and, more importantly, why they have to. Drawing on stories and case studies, and with reference to the UN's Sustainable Development Goals, its no-nonsense approach sets aside the ideals to confront the realities of business reform. It demonstrates the power and potential that a Single Organizing Idea can bring to any business prepared to take its head out of the sand and proactively respond to today's challenges. NEIL GAUGHT is what Malcolm Gladwell would call an outlier. Neil was born in Hertfordshire in the UK in 1963. Following a short spell in the British Army and an even shorter one in the French Foreign Legion he completed his education at the London College of Printing where he gained a BA(Hons) in Graphic Design. A year after graduating he founded his first business, a London-based design consultancy. Having successfully run the business for ten years he sold it to a marketing company before joining WPP’s largest global brand consultancy, Enterprise IG. There he took a leading role on a variety of high profile branding projects for Merrill Lynch, DeBeers, Andersen, Scottish Power, BG Group and Standard Chartered Bank, among others. In 2003 Neil and his young family moved to New Zealand for the adventure. Following three years with the country’s leading agency DesignWorks, Neil re-established his independent consultancy status. Since then he has advised a wide variety of organizations, ranging from international NGOs and energy, manufacturing and infrastructure corporates to tech start-ups, global faith based organizations and government institutions across Asia Pacific, Europe, Africa and the USA.